Cockroaches are one of the most common creepy crawlies that can send tingles down one’s spine or make your skin crawl. There are two main types of cockroaches: German and American. The former is smaller in size (brown banded roaches are small as well) while the latter are the larger ones. German roaches are difficult to control for the untrained individual and they carry diseases that can cause diarrhea, dysentery, and food poisoning. 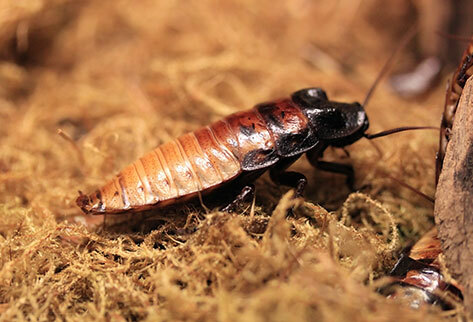 Other common roaches found the United States include woods roaches, oriental roaches, smoky brown roaches, and Australian roaches. There is always more than one roach: It’s normal to physically spot a roach at night because they are nocturnal insects. If you frequently see them in the day, it might indicate an infestation has been taking place for some time. You see cockroach feces: Roaches have high metabolism and they eat everything from plant matter to garbage, dead skin cells, human food, and yes, even feces. If you spot a considerable amount of droppings around your property, prompt action is recommended. A strong musty or oily odor: This indicates a serious infestation has been going on for some time. You may even start to find bodies of dead cockroaches throughout your building. Keep your place clean at all times: This includes removing any food sources, wiping up food spillage, cleaning dirty dishes promptly, and more. Make sure all your trash containers come with tight lids as well. Remember to vacuum cracks and crevices regularly too. Seal up potential entry points and hiding places: This is needed to prevent future roach infestations from taking place. You should seal cracks with caulk, reduce moisture levels in crawl spaces, and repair any water leaks. Place bay leaves in high risk zones: Not the ultimate solution you should go for but roaches hate the scent of bay leaves. You can use these leaves as a natural repellent. Simply crush them up and sprinkle them near possible entry points, behind appliances, and in storage equipment. Call all types of cockroaches fly? It depends. A roach’s ability to fly varies according to gender and species. German roaches, a common household pest, do not fly. Why do I always find dead cockroaches on their backs? Roaches have trouble righting itself if they can’t grab hold of something with their legs. If you sprayed insecticide on them, the roach experiences muscular spasms which often lead to them flipping on their backs. Although cockroaches are omnivores, they are often not aggressive enough to attack humans. However, it is possible that they can bite humans, especially when their population number is high and the food source is too small. Need Help with Cockroach Control Today? PEST is a Green Shield Certified cockroach control specialist you can count on to help you get rid of roaches. Our experienced technicians will be able to look at your property and related structures to determine the source of the cockroach infestation within a short period of time. You can rest assured that our solutions are safe and will not harm you and others who happen to be in the vicinity. Give those cockroaches an eviction notice and let them know they are no longer welcome. Call us at 212.945.0868 or email us at info@pesteliminationsystems.com for more information.